Paws In Need Animal Rescue is a small non-profit animal rescue in the Edmonton area. They rescue stray, homeless dogs and cats from many different situations. All of their rescues are brought into foster homes where they are rehabilitated whether it be for health reasons, training or some much needed TLC before they are available for adoption into their forever homes. They believe all animals young and old deserve a second chance. Paws In Need Animal Rescue is run solely by volunteers and through community support of fundraising, donations and volunteers, they are able to care for the animals while they are with them and help them on the road to recovery and towards finding their forever homes. WHARF is a non-profit animal rescue that is here to provide homeless, neglected, abandoned and injured animals with a place to live until they can find their forever family. Their mission is to help needy and homeless pet find shelter, love and rehabilitation until a permanent home comes around. They provide all necessary vet care, a good quality of life,and sometimes for the first time in the lives of these innocent animals,a sense of family, love and kindness. They are in constant need of donation items. Cat litter, cat food, dog leashes and dog beds are mostly needed and of course, any financial donation is greatly appreciated. WHARF has several long term residents who are desperately waiting for their forever home!! Please visit their website www.wharfrescue.ca or check out their Facebook Page to find out how you can help and please give one of these fur-babies a wonderful, loving home!! The Barrhead Animal Rescue Society (B.A.R.S.) was established in January 2010, and is dedicated to ensuring the humane treatment of all animals. They provide a safe and nurturing environment for unwanted, abandoned, lost, and mistreated pets until they can be placed into loving homes. Through proactive intervention, public education, fundraising events, and community outreach, the Barrhead Animal Rescue Society seeks to promote respect for all life by breaking the cycle of abuse, neglect and pet overpopulation in the community. The Barrhead Animal Rescue Society is supported through private contributions. To develop a program to adopt rescued animals out to good homes. Develop a neutering and spaying program for cats and dogs. To educate the public on the proper management and care of their pets. To assist pet owners that have good intentions but lack the knowledge and or funding to maintain proper health care regimes for their pets. To assist those pet owners that due to short term health issues, cannot provide their pets with proper care. BARS has several fur babies ready to find their forever homes so please visit their website www.barrheadanimalrescue.org or check out their Facebook Page. Whisker Rescue is a no-kill organization relying on volunteers and foster families to give every cat that enters their adoption program the time, patience, love and cuddles they need until their forever homes can be found. They provide basic needs such as shelter, food, medical attention and adoption opportunities to stray, homeless and surrendered cats. Although they do not have a shelter, they are fortunate to work in cooperation with several Red Deer facilities (as well as Edmonton & Olds), who have generously donated time and space to help them. A warm kennel and cuddles from volunteers and vet staff. You can support this wonderful rescue by donating your time as a foster or volunteer or provide much needed financial aid by signing up as a Guardian Angel or by making a one time donation. Please visit their website www.whiskerrescue.com or check out their Facebook Page. Little Cats Lost (Trap-Neuter-Return) Society is made up of a small group of compassionate, intelligent volunteers that believe in the humane treatment of cats, owned or unowned. Their mission is to humanely reduce euthanasia and the growth rates of feral cat colonies by preventing their breeding cycles through spay/neuter practices, while educating the public on the merits of a Trap-Neuter-Return (TNR) program in the community. They also supports wild/stray cats/kittens that find themselves deposited in the city Animal Care & Control Centre. Through their relationships with animal care facilities, they remove many animals classed as unadoptable, then rehabilitate those animals and place them up for adoption into loving forever homes through the adoption arm of the organization. It is thanks to their work with street kittens and cats that they have been able to gain a great deal of behavioral experience in this regard. LCL do not receive any government funding therefore rely solely on the generosity of donors. If you would like to find out more on how you can help, please visit their website http://www.littlecatslosttnr.org/ or check out their Facebook Page. Please welcome the Hervey Foundation for Cats as my December Rescue of the Month! The Hervey Foundation for Cats is a place of refuge for cats who otherwise would perish: the abandoned, the abused, the sick, the old, the suffering and was founded by Marjorie Hervey in 1998 to provide care and loving homes for the unwanted, uncared for and abandoned cats that fall into our society. Since that time over 3,000 cats and kittens have come into their care and most have found good, loving homes. The balance stay with them to live a quality life. The Foundation’s prime objective is to offer either a temporary or long-term place of protection for injured, unwanted, homeless and abused cats. In addition, they promote and educate the public on the proper treatment of cats all in keeping with the requirements of the Animal Protection Act. If you would like more information on this amazing foundation, please visit their website http://www.herveycats.com/index.html or check out their Facebook Page. 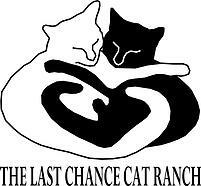 Please welcome Last Chance Cat Ranch as my November Rescue of the Month. The LCCR is a not-for-profit cat rescue that is a no-kill organization. They are the largest cat rescue south of Calgary and currently have over 130 cats in their care. They have been in operation since 2003 and are run by volunteers and rely solely on donations. All of their cats are in foster homes as they have no building of their own. One of their long term goals is to be able to have a building for intakes and adoptions. They work extremely hard to save stray cats and kittens from an untimely death. They also provide necessary veterinary care to abandoned cats and find forever homes for abandoned and stray cats. Since they do not receive any funding, they count on the generosity of the community to help they continue their wonderful work. They are a CRA registered charity and would love your support. If you are able to provide financial support, I am sure they would greatly appreciate it. They are also constantly in need of foster homes and volunteers so feel feel to reach out to them if you are able to help out in that way. I would like to welcome Matty’s Place Cat Sanctuary as my first feature Rescue of the Month for October 2015. This is a wonderful local rescue that makes a huge difference in the lives of sick,hurt,abandoned, abused and disabled cats out there. They provide specialized care in a home setting and work really hard to establish a bond of love and trust with these fur babies. Matty’s Place is a registered Canadian Charity and is supported solely through charitable donations. Without the assistance of all those who donate time, food and monetary donations, it would not be possible to continue. It goes without saying that they could definitely use monetary donations. Being home to several hundred cats as well as taking care of a Feral Colony on their land comes at a price, spay and neutering, emergency vet bills as well as everyday costs to keep these animals healthy and happy takes a toll on the pocketbook. If you would like to help out in any way, please contact Matty’s Place through their website http://www.mattysplacecatsanctuary.com or email me at crazycatladycorner@yahoo.com and I can get you in touch with them. Beautiful pic of the cat! Very nicely written! Thank you! Thank you:) I hope it helps to get the word out about your wonderful sanctuary!